The 3rd Instruct Biennial Structural Biology Conference took place in Brno, Czech Republic, from May 24 to May 26, 2017 hosted by Instruct-CZ/CEITEC. Brno is the city of Johann Gregor Mendel, a founder of modern genetics and one of the first scientists who applied a multidisciplinary approach to explain his observations. The social programme of the meeting included a visit to the Mendel’s Museum and dinner at the Augustinian Abbey, where Mendel worked and lived. 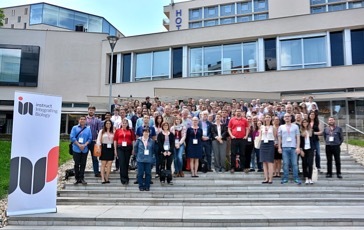 250 scientists from all over Europe and beyond participated at the conference including researchers who presented their results obtained through access to major cutting edge technologies available at Instruct Centres. Access has been available to European member researchers since February 2012. This the third edition of the Biennial conference, the previous ones being hosted in Heidelberg and Florence and the programme included sessions representing recent structural biology highlights, emerging methods and technologies and results of biomedical importance. A fantastic set of speakers were selected by the Scientific Organising Committee chaired by Prof Vladimir Sklenar with the participation of Prof Lucia Banci, Dr Anastassis Perrakis, Dr Bruno Klaholz, and Prof John Briggs. The list of speakers included: Albert Heck (Utrecht University), Juli Feigon (UCLA), Richard Stefl (Masaryk University), Leemor Joshua-Tor (Cold Spring Harbor), Kristina Djinovic-Carugo (University of Vienna), James Naismith (St Andrews and Oxford University), Masahide Kikkawa (University of Tokyo), Andrew Carter (MRC-LMB), Radostin Danev (Max Plack Institute of Biochemistry) Thijn Brummelkamp (NKI), Michael Sattler (TU Munchen), Babis Kalodimos (University of Minnesota), Andrea Musacchio (Max Planck Institute)and Petr Leiman (The University of Texas Medical Branch). 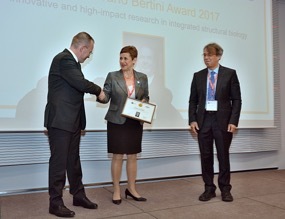 A highlight of the conference was the announcement of the 2017 Ivano Bertini award to Lucia Banci, Professor of Chemistry at the University of Florence and Director of CERM who received her award from previous awardee Stephen Cusack (EMBL). Prof Banci is recognised as a world class leader in the characterisation of functional processes in a cellular context with atomic resolution, with a major emphasis on NMR methodology. Her work integrates structural, interaction and dynamical information with thermodynamic properties, particularly in metal ion trafficking in the cell. Most recently, her work uses an innovative NMR approach that detects single proteins and their transitions at atomic resolution and in the live cell environment, thereby realising the bridge between cellular studies and structural characterisation. The Ivano Bertini Award is offered by Instruct to recognise a significant achievement in frontier research that utilises an integrative structural biology approach. The award is an independently reviewed competition and commemorates Ivano Bertini, who developed powerful new methods in NMR and founded CERM in Florence. The award of €15,000 is endowed by Bruker BioSpin which is at the forefront of NMR instrument development with increasingly broad application and measurement sensitivity. A particular focus of the Biennial conference is to highlight the work of early career researchers. Four speakers were selected from abstracts submitted for the conference to present their work: Moran Shalev Benami (Weizmann Institute of Science), Vladena Bauerova (Institute of Molecular Biology Slovak Academy of Sciences), Giulia Glorani (University of Verona) and Aurélien Thureau (Synchrotron Soleil). In addition 4 prizes were given to the best posters selected by the Scientific Organising Committee. The MiteGen prize went collectively to three outstanding posters from Prof James Naismith’s lab. 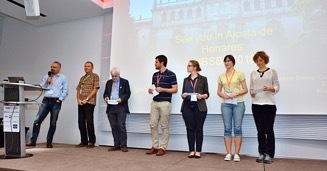 The other poster prizes were awarded to: Pablo Alcon for “Crystal structure of the endonuclease Cpf1 R-loop”; Dorota Rousova for “Characterisation of deformed wing virus 3c protease and its precursor 3cd” and Marjetka Podobnik for “Structural and functional studies of pore forming proteins”. Instruct Director Prof Dave Stuart closed the conference with an overview of structural biology current development and future directions and an invitation to the next Biennial hosted by Instruct-Spain in Alcala de Henares 23 to 25th of May 2019. In addition to the organisers, speakers and participants, we would like to thank the Sponsors for their support for the conference. The 4th Instruct Biennial Scientific Conference will be hosted by Instruct-ES Centre (CNB-CSIC) at the historic location of Alcala de Henares.